With things slow at work, I took Friday off and drove down to Pittsburgh to see the Cardinals finish up the season. I stayed in a nice hotel downtown and walked everywhere. The ball park was about a 10-15 minute walk from the hotel, just across the Allegheny River. The scalpers had a good selection, and nothing was close to being sold out (of course), so I bought from them all three days. Only Saturday’s ticket was over face value, and that was only by $3. I stayed on the 1st base side. Friday night I was behind the screen in Section 114. Saturday night I was in the third row of Section 112, which was probably the ideal spot for me. Sunday afternoon I was in the 11th row of Section 8, right off the Cardinals dugout. Great weather all three games—maybe a little chilly Saturday night. The park was nice. I can’t believe it’s been there for seven years. Seems like just the other day they were playing in Three Rivers. The Pirates were sporting hideous red vests. Wellemeyer had a great start—one run and three hits in six innings. Pittsburgh’s starter, Duke, pitched well also, and it was tied 1-1 after seven. It fell apart for the Pirates in the eighth, when the Cards scored four, three of which were knocked in by Edmond’s pinch-hit single. Wainwright had a shaky first—three runs on three doubles and a single. After that, though, he was rock-solid for six innings, and the bullpen held them at three. Ankiel hit the first homer of the series, a solo shot, one of his three RBIs. I was surprised at the large number of Cardinal fans all three games. I was surrounded by them on Saturday. The team clothing was almost split into thirds: Pirates, Cardinals & Steelers! I ate at Manny’s BBQ (Sanguillen). Supposedly, Manny sometimes hangs out there, but I didn’t see him. Good, spicy pork BBQ, but the bun was kinda stale. There was a concert after the game by The Clarks, a Pittsburgh band. I’d never heard of them before, but the crowd sure knew them. The Cards’ starter wasn’t announced beforehand, and it turned out to be… Troy Percival! Read later that it was his first start in the bigs after 638 relief appearances—a record. Might be his last appearance in the bigs too. Anyway, it was some kind of a stunt, because he was lifted after one inning. Schumaker had a big day, going five-for-five and knocking in three. The Cards tied a record for most pitchers in a nine-inning game: ten. Brought the camera Sunday and took a few photos. The player pics were taken with maximum digital zoom, so they’re not very sharp, but I think they turned out OK. The ABL simplifies runner advancement on singles. I think the only way to go from first to third on a single is on a hit-and-run. This made me wonder about how often runners advance past second on a single. 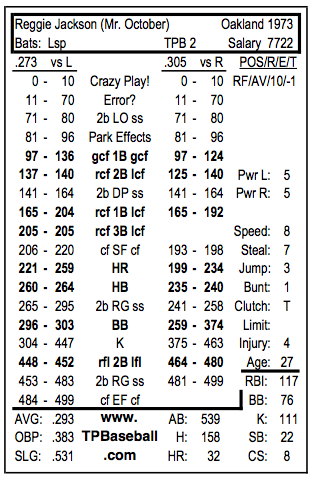 Here’s what I got from the Retrosheet event files for 2006. (single_first.pl) These are singles with a man on first and no other base runners. Advancement on fielding errors counts, but getting thrown out doesn’t. About a one-in-four chance to move the man to third. That sounds about right. Why did more guys go from first to third back then? Had another bash at Chadwick, now that the Retrosheet event files are back on-line. Rebuilt the 0.4.0 version & it works again. Edited /usr/local/bin/chadwick to run pythonw instead of python. Chadwick loads & displays the 1973 NL & AL event files just fine, even though I zipped them up myself. Wiped the *.EV[NA] files and entered a TPB game. (Remembered to save this time!) It loads back up, even if I unzip & re-zip. Tried entering a TPB game directly. Finished in under 45 minutes. Hardest thing is tracking the number of batters faced. Good game. Pirates threatened in the bottom of the ninth, but Hrabosky struck out Stargell to end the game. Stargell also committed a crucial error in the seventh that let the two deciding runs score. Not a good night for Pops. Had to go in and edit a couple of unearned runs, and things zipped back up just fine. Also tried cwbox, the box-score generator that’s available only in the development version. 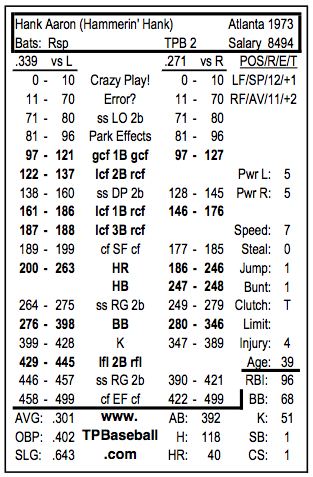 Turns out it produces a smaller box score similar to those found in the newspaper. Here are a couple of logo designs for the Titusville Perfectos. Based on the NASA logo, natch. Thought I’d take a look at the latest development version of Chadwick. Chadwick in is an SVN repository, so downloaded an SVN 1.44 installer. Had to build configure from the *.in files. That builds OK, but the python stuff doesn’t build–there’s no libchadwick_python.c file. Rats. Now I can’t get the working version re-installed. Feh. BTW, that 1973.chw file is poisoned somehow. Can’t figure out what it is. 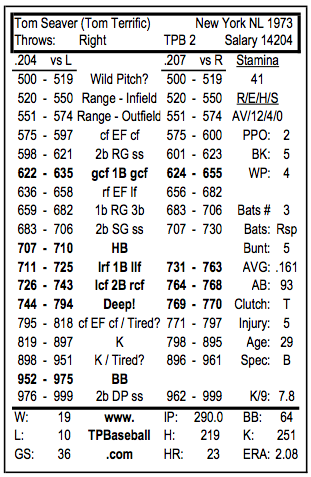 One thing caught my eye in the Curve Ball book: batters playing at home hit 12 points better than on the road. Makes sense, but it’s almost as big as the lefty/righty match-up difference, which they say is 15 points. And yet, AFAIK, there are no adjustments in TPB to take home-field advantage into account. It’s almost 8 points. Not as large as 12, but, of course, there’s more to winning than hitting! 2007-10-07: The Commish’s comment re capturing home-field advantage in Park Effects is very interesting. 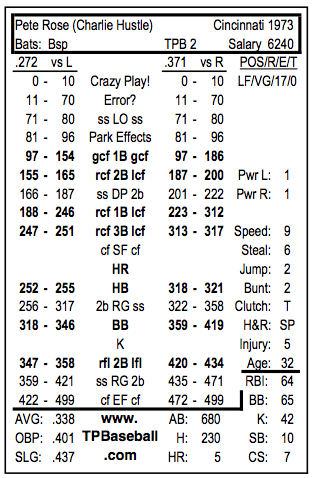 I might even replace the LHB/RHB categories with home/visitor. The iTunes Store has 29 (and counting?) full-length games for $1.99 download. I’ve downloaded & watched only one so far: the 7th game of the 1952 World Series between the Yankees & Dodgers. Good stuff! Here are a couple of score sheets using the Situational Scorekeeping method. I modified Reisner’s design a bit. A slightly smutty ditty about a very famous couple. Written & performed by Bob Peck, about whom I can find very little info. Didn’t expect it, but this book starts out with a simple analysis of All-Star Baseball, APBA, SOM & Sports Illustrated Baseball! Interesting point about the SOM method of splitting the rolls: the batter’s ability is purely additive, that is, there’s no direct interaction with the pitcher. You can get some of that with pitcher symbols in TPB, of course. I really like this Situational Scorekeeping method devised by Alex Reisner. It combines the best of the traditional & Project Scoresheet methods. The PDFs provided are very professionally formatted, and there’s great documentation. Plenty of room to write. Shows the men on base when the batter’s hitting. Easy to keep track of batters faced. Easy to see whether batter scored, made out, or was left on. Have to switch between sides of the page. Separation of innings is not as clear. Lots of other great stuff on Reisner’s site. The last few games I’ve been rolling on the $@%*@! ranges & errors like crazy. How about cutting them down without altering the results too much? I just get tired of looking the damn things up. The Deeps are suspenseful, but the ranges & errors are just a chore lately. 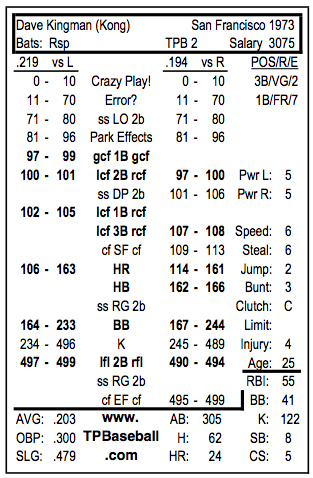 Range plays are pretty much 50/50 between hit & out, so how about foul balls on even rolls to infield & outfield range? Could do the same thing with possible errors: even rolls are fouls. But that cuts the errors in half. How about on the odd rolls that go to possible error, the roll for the error is halved when even. This will pump up the number of errors from 50% to, I dunno, 75%? The first problems involved colors. Had to change the valid entry background from SYS_COLOUR_WINDOW (black) to something else. Also had to change the dark green background from (0, 150, 0) to white. The next problem is the line-up windows, which have scrollbars that cover up the info and don’t scroll. Tried to change the type from ScrolledWindow to Window. The size was perfect, but the windows didn’t refresh properly. The event entry works well, and I haven’t seen any problems as long as I stick to the correct syntax. (The best documentation of that is on Retrosheet.) The highlighting that shows valid/invalid input is invaluable. Unlimited undos, which is also great. The box scores & narratives are very cool. Brother Michael gives high marks to SBS (Strategic Baseball Simulator), a free PC game. The St. 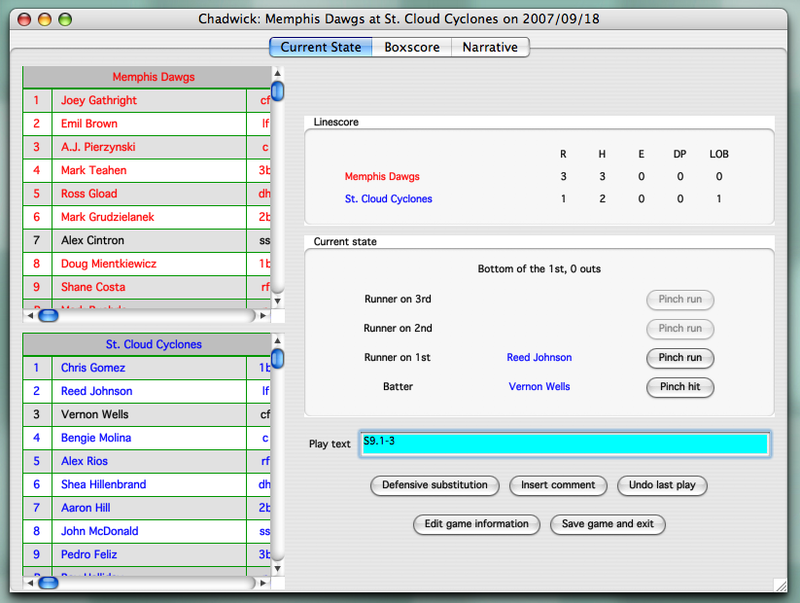 Cloud Cyclones blew into Memphis and handed the Dawgs their third straight loss. The Cyclones broke a 2-2 tie in the fifth on a lead-off home run by Pedro Feliz and four more hits to put them ahead by three. Mark Teahen homered in the sixth to get the Dawgs to within two. St. Cloud exploded for four runs in the top of the ninth, half of them after a crucial error by Dawgs third baseman Teahen. Memphis threatened in the bottom of the ninth, scoring two, but went down with the tying run in the on-deck circle. PS. After the XBL game the Dawgs manager got one back on the Commish, when his 1973 Cardinals defeated the 1973 Yankees 7-0, behind a complete-game shutout by Bob Gibson. Print with no margin and they come out 4×2.75 inches. Two long cuts (half-inch left at bottom) and three short cuts with the resulting strips. I still can’t figure out what the instructions are getting at with the method to print them out larger with legal size. Both letter & legal are 8-1/2 inches wide! I don’t like the borders. They make centering errors seem worse. The Commish sez Lance added the borders at someone’s request.